Elton Mullally is a former student of Pulse College and his latest work, his debut feature – length documentary Starboard Home is about to be premiered as part of Trad Fest 2019. You’re probably thinking Elton took a film course here at Pulse College but in fact Elton was a student on the Diploma in Audio and Music Technology course. We caught up with Elton to find out a bit more about how he got into film and to learn more about his involvement in Starboard Home. Elton, how did you find your way into film? I kinda fell into the whole TV and film production world by accident. I have a strong musical background, I write music and have played in lots of bands down through the years and by chance I got a job working as a researcher on a Channel 6 music show called Nightshift. After a couple of years there, I became the producer of the show. It was a really good learning path, I had lots of different roles on the show and picked up loads of new skills. Not only was I producing, I was directing, shooting, editing, a main point of contact with the bands that appeared on the show and even made the tea once in a while! On the back of working on the Nightshift I started my own production company which morphed into Southpaw Pictures about 4 years ago. Rob Davis who’s a good friend of mine and who has a very similar industry background in television runs the company with me. We cut our teeth with a late-night music show on RTE which ran for two seasons called Under Ether which I also co-presented. Another series which worked well for us was the 6-part RTE New Comedy Awards. We have delivered a TV special of the Choice Music Prize event for RTE for the last 4 years and will do so again in March. We’ve done a lot of music videos with the likes of O Emperor, James Vincent McMorrow and Delorentos. We also do corporate gigs, which helps keep the wolves from the door. So, it’s been a really busy few years! As a company we are constantly striving to bring in new and exciting projects, and Starboard Home definitely falls into this category. Sure! Starboard Home is a documentary that features a bunch of Irelands finest musicians. The film was made by myself, Rob Davis and Moira Sweeney. The documentary focuses on a the very popular Starboard Home album from 2016 and showcases the subsequent concerts in the National Concert Hall as well as behind the scenes studio footage, interviews with the artists, etc. The album celebrates the bond between Dublin port, Dublin city and the river Liffey that connects them. The port is a big part of Dublin’s history and its connection to the people of Dublin and Ireland makes a great focal point for the project. We were approached by James Vincent McMorrow’s manager (Ken Allen) a couple of years ago who asked us to get involved. The project was funded by the Dublin Port Company who have a brilliant ongoing initiative supporting the arts in Ireland be it visual arts, poetry, music etc and in 2016 the chosen area being funded was music. They started to put this project together where they asked Irish songwriters to compose a song on the relationship between the port the Liffey and the city. 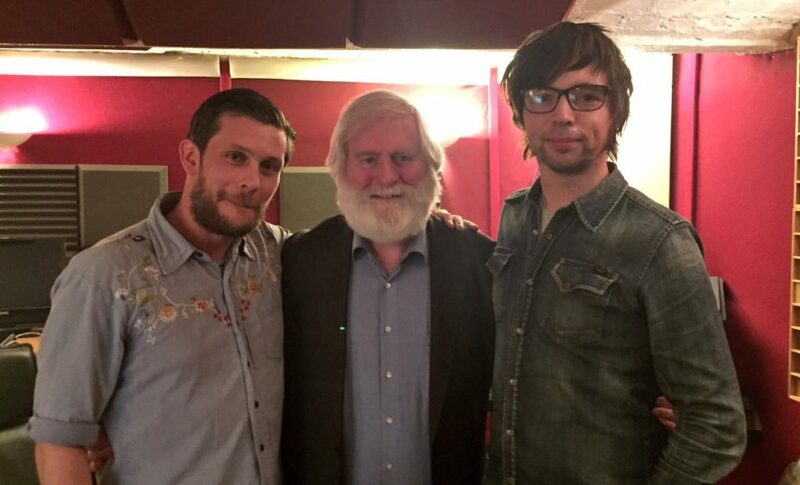 Paul Noonan of Bell X1 curated and produced the album, alongside Gary Sheehan from the National Concert Hall. We were brought in very early on to shoot b roll footage and interviews with the main people involved and this footage was initially used as promo material for the album and concert. Originally, they hadn’t planned to shoot a feature documentary. The more we recorded the more we were invited back, and from here some music videos were then produced. It was about 2 years after the album that Dublin Port asked us to meet with Moira Sweeney to discuss making a full documentary together as we’d got tonnes of great footage. Of course, we jumped at the opportunity. There was a lot of interest in it and Tradfest got in touch with a proposal to screen the documentary at the festival this year. It’s a first feature length documentary for Southpaw Pictures and we’re thrilled with the results. That’s really exciting! When can people see Starboard Home? It screens in the IFI on the Sunday 27th January at 1:00pm and for anyone interested you can book your ticket online now! If you’re a fan of Irish bands and songwriters I think they’ll really enjoy the documentary. Most of the songs from the album are featured in it and there’s some lovely footage from the live shows in the concert hall too. The artists featured include Paul Noonan, Gemma Hayes, James Vincent McMorrow, Duke Special, Cathy Davey, Declan O’Rourke, John Sheahan from the Dubliners, Paul Cleary from The Blades, Colm Mac Con Iomhaire to name a but a few! What was your approach to producing the documentary? It many ways we came at it in reverse, it was a little unorthodox to tell the truth! We ended up shooting a lot of the b roll footage first from the studio sessions, it was a very guerrilla style approach. We were at the studio with a couple of DSLR’s and a Zoom Recorder and we shot what we saw. There was a lot of hand-held recording, which actually suited that environment fantastically well. When we were brought back in to do the shoot in the Concert Hall for the live gig it was a totally different beast and a much bigger setup. We had our studio setup backstage, I directed that shoot and had a vision mixer, we’d two manned cameras for wide shots and mid shots at the back of the venue and hot head remote cameras setup on the stage and on the balcony’s. I did a rough line cut using the vision mix on the night and we took all the isolated footage from the cameras to cut into the final documentary. The different approaches between the high res recordings at the concert hall and the early studio footage create a wonderful contrast. You actually studied music technology at Pulse not film! What happened there?? Yeah true story! Back in 2016 just after the Starboard Home album was release, I decided to go back to college and do a course. I was initially going to do a part-time film course in Pulse and went along to an open day where I met JJ Harrington the film course director. After chatting with her for a while we both decided that with my background in film, I would probably be a little too experienced for the film course, so I decided to do the music technology course instead. I’ve been mostly self-thought when it comes to music tech and recording etc so it was the ideal course to pick up techniques from the pros in Pulse and really hone my skills. I absolutely loved the course; the lecturers were brilliant, and the facilities are world class. I still write music and perform with bands regularly, so it ties in well. Also, in terms of film production I’m now better positioned to understand the audio side of things.